Be careful what you wish for? Don’t wander from the path? Follow your dreams? Moral lessons are always at the punch line of classic fairy tales, and if Into the Woods is anything to go by, there sure is a hell of a lot of lessons being learnt in fairytale land. Based on Stephen Sondheim and James Lapine’s stage musical of the same name, Into the Woods seamlessly entwines the fairytales Cinderella, Rapunzel, Red Riding Hood and Jack and the Beanstalk into an all-singing adventure full of twisted humour and lessons in morality. In a small village on the edge of gigantic woods, The Baker (James Corden) and his Wife (Emily Blunt) are desperate for a child. The Witch (Meryl Streep) who lives next door tells them they are cursed to never have children because The Baker’s father stole from her a long time ago. She offers them a way to reverse the curse if they find four items before the Blue Moon in three days time: a cape as red as blood, a cow as white as milk, hair as yellow as corn and a slipper as pure as gold. Elsewhere in the village, Cinderella (Anna Kendrick) is treated like garbage by her Evil Stepmother (Christine Baranski) and her two Ugly Stepsisters, forced to clean the house instead of attending a three-night ball at the royal palace. Red Riding Hood must visit her ill grandmother, and Jack (Daniel Huttlestone) is told by his mother that he must sell their old dairy cow at market. Their stories intersect as each finds a reason to venture… into the woods. With stunning production and costume design, and spectacular special effects, this film is a visual delight. 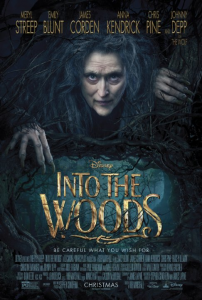 Director Rob Marshall is known for successfully adapting big stage musicals for the silver screen, with his musical extravaganza Chicago winning the Oscar for Best Picture in 2002, but with Into the Woods, there is something that feels a little off. Perhaps with the added freedom to include more sets and expand the fairytale universe, the film falls a bit flat by adding more style than it provides substance. That being said, the film is undeniably entertaining. Its first half is a mixture between slapstick comedy and classic fairytale, with the enchanting performance of Emily Blunt as The Baker’s Wife providing much of the film’s charm and humour. However, it lags in its rather unexpected second half, and becomes tiresome all too quickly. A second unnecessary quest is followed by a constant string of mediocre musical numbers, which had me hoping for a quick and brutal ending for all involved. For an unfamiliar viewer, none of the songs truly stand out or make much of a memorable impact. This isn’t the type of musical to have grand ensemble numbers with choreographed dance movements, but rather over-the-top solo ballads that explain how a certain character is feeling at a certain moment. The film does successfully portray its female characters, each of them having their own hopes and dreams that propel them through the story. The Baker’s Wife is the gutsiest and most entertaining as she proves to have more intelligence and strength than her dim-witted and fretful husband. But she does have a name that (perhaps ironically) declares she “belongs” to her husband, The Baker. Even worse still, she meets a tragic end due to moral wrongs on her behalf. The Witch is initially portrayed as evil, but becomes more compassionate and nurturing as the film goes on. Her internal struggle – between desiring external beauty and finding the beauty within – is a tiresome cliché, but with Streep pulling the strings it the character is rendered more sympathetic. Cinderella, on the other hand, is uncharacteristically (and refreshingly) indecisive about her future for a fairytale princess. She wishes to be freed from her dreary existence, but finds the affections of her Prince Charming (Chris Pine) a little too much. The only clichéd fairytale female in the film is dull damsel-in-distress Rapunzel (Mackenzie Mauzy), but she doesn’t get as much screen time as her fellow women. Much has been changed in this Disney-fied version of the musical; it’s far less dark and macabre, and happily ever afters happen to those who perhaps don’t actually deserve them. 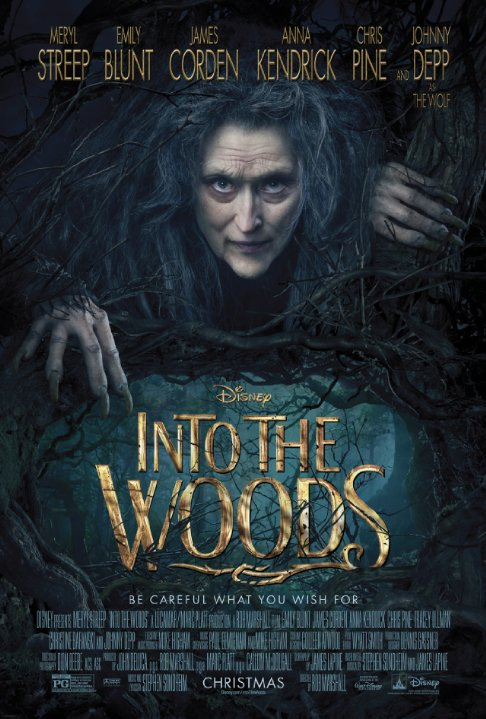 It’s a shame that Into the Woods fails to retain that certain darkness that runs through all of Sondheim’s work. His other most famous work, Sweeney Todd, kept its creators black humour intact when adapted by Tim Burton in 2007, but Into The Woods unfortunately chooses cheeriness over bloody, entertaining carnage. Into the Woods has ticked all the boxes for a sure-fire hit musical adaptation: all-star cast, beautiful costumes and production design, plus beloved characters and a well-known storyline, but overall it feels like something bigger is missing. Perhaps with a little more wit and wickedness it would have become the perfect candidate for a musical classic.